Popular Novel "ATHADU ADAVINI JAYINCHADU" on silver screen. Published in 1984, this book continues to attract readers for over three decades even till today. 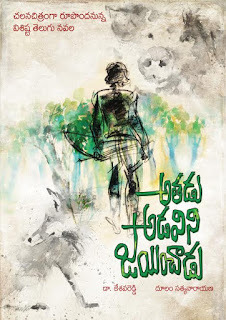 Written by well known Telugu novelist Dr Kesava Reddy, ‘Athadu Adavini Jayinchadu’ is set to become a feature film now. DSN FILMS has bought the worldwide filmmaking rights for the novel. With international filmmaker Dulam Satyanarayana set to helm the project and with a couple of other co-producers in tow, the film is soon going to be seen on the silver screen. The book ‘Athadu Adavini Jayinchadu’ is a remarkable piece in Telugu literature. And I think the story has the capability to attract the international audiences. And so, with that in mind, the film will be produced on a high budget with high technical and aesthetic values. “This new film will be made well enough to be presented at international film festivals like the Cannes, Berlin, Locarno, Toronto and Busan and will be qualified to go to the Oscars too. We are presently in talks with international technicians for the project,” says director Dulam Satyanarayana..
Dulam Satyanarayana has worked on several international documentaries till now. In fact, for his film on Telangana tourism, he was presented an international award in Portugal..